September 17, 2013 is a hallmark occasion. It's the day the world sees Grand Theft Auto V. It's the most hyped game of the year, and rightfully so. 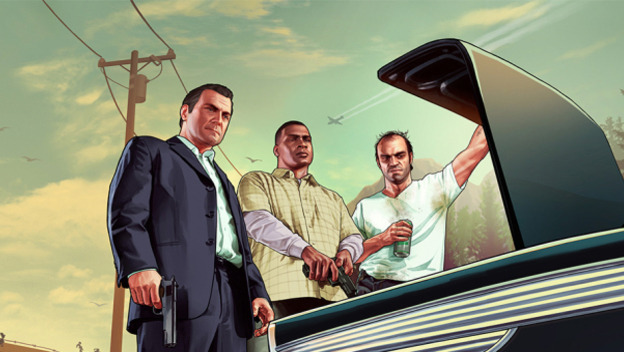 Where The Elder Scrolls V: Skyrim and Mass Effect 3 were the most anticipated releases of 2011 and 2012, it's undoubtedly GTA V that will lay claim to 2013. Rightfully so, too. It isn't just that this is the first numbered installment since 2008's Grand Theft Auto IV; it's more than that. Grand Theft Auto V is shaping up to be a game that will change open-world adventures as we know it. The most notable change to Grand Theft Auto V is the fact that there isn't just one antihero gamers will rally behind. While it seems that rich, retired bank-robber Michael De Santa is the star, co-stars Franklin and Trevor are equally essential: both in the narrative and the heists. Each one has special skills and a rich story. For example, we know that Michael has a bullet-time ability, which will make shootouts easier. Franklin's good with weapons too, and he’s quite strong, but he’s best behind the wheel of a car, thanks to his current job as a repo man and his past as a gang banger. Trevor's the wild card, and while he still has some impressive flying skills (since he's a veteran and was a pilot with the military), his greatest skill is the ability to fly into a berserker rage, dealing out more damage than usual to anyone unfortunate enough to cross his path while also having a defensive boost that will protect him from people attempting to retaliate. What's especially interesting is, while the GTA V trio are basically a player's puppets, they also have a life of their own. They aren't waiting around for players to just show up and decide to take on some of their missions and advance the story. Michael, Franklin and Trevor have lives. If a player decides to switch to one of them in the game, which can be done at practically any time, the men will be doing whatever pleases them. Franklin could be at work. Trevor could be lounging at home. You never know what the other men will be up to, or where they'll be in Los Santos, unless you take a look. 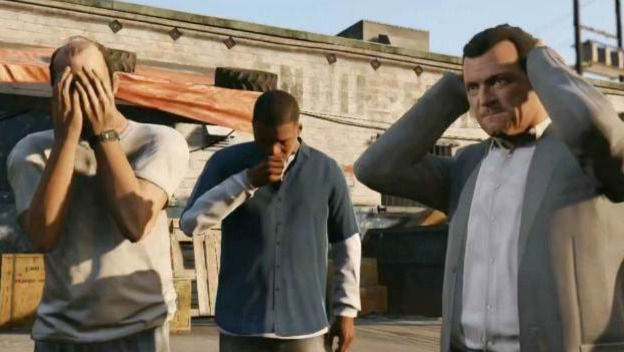 It's only appropriate that Grand Theft Auto V has three protagonists, because the city of Los Santos is too large for one man. The map leaked earlier this week and it's gigantic. It's bigger than San Andreas and Liberty City combined. Buy GTA V, and you can explore every inch of it. Consider Los Santos your own private island paradise. Of course, since the map is that big, going by foot, bike, or even car won't be nearly enough. When there's that much space, players need more options--which means using any possible method to take to the land, water, or sky. Cars are a given, but a city this large craves variety. That means you can hop in different kinds of helicopters and airplanes to rule the sky. After all, Trevor was a pilot before he was white trash, and Michael seems like the kind of man who has more money than God. You know that crop duster is going to look inviting. And if you prefer to explore the shoreline, well, grab some scuba gear, a jet ski, or a submarine. Even the virtual world can be explored in GTA V. Sure, previous protagonists may have had cell phones to keep connected with friends and family, but Grand Theft Auto V is the first game in which the Internet matters. Your characters don't just have phones; they have smartphones. They'll be keeping in touch with the folks that matter, sure, but a player's iFruit is more than that. It's about keeping in contact with people and taking screenshots to share on the Rockstar Social Club. It's also about using that virtual Internet to navigate Los Santos' stock market or purchase property. I know the idea of going crazy and buying up businesses may seem boring, but think about the potential for profit. Buy the right clubs, entertainment hotspots, and businesses, and you may end up making as much money as you would from a heist. Still, while a virtual Internet is amazing, it pales in comparison to GTA V's compatibility with the actual Internet. With Grand Theft Auto V comes access to Grand Theft Auto Online, the GTA MMO you've been dreaming about since Grand Theft Auto III. I don't know about you, but GTA Online is now the one and only reason I'm buying GTA V. Though this addition won't be released until October 1, 2013, it seems it will be worth the wait. After all, how often do gamers get access to an open world, stand-alone, Grand Theft Auto game with over 500 launch missions, a completely customizable male or female avatar, and the ability to form private crews of 250 members or join Rockstar-created public crews with an unlimited number of space for players? It's as though, for the first time, people are really going to be given the opportunity to explore a gigantic, virtual city and do whatever makes them happy. Follow along with Rockstar's missions, go on crime sprees with friends, engage in feuds with an opposing crew, or maybe just enjoy some scuba diving with strangers. It doesn't matter. GTA Online will let you do anything you want. Sit at home in your apartment, once you can afford one, if you'd like. If you decided to pick being a couch potato as a daily activity, it'd certainly be appropriate. If that doesn't do it for you, then go on a few heists to earn enough money to get a haircut, a tattoo, a nose ring, and a new wardrobe to help you turn over a new leaf. With Grand Theft Auto Online, there's no wrong answer. You do what you want, when you want, with whomever you want. It all comes together to make every excited forum post, pre-order, early declaration of love, and sick-day cash-in seem warranted. We won't know for sure if Grand Theft Auto V will meet every expectation until September 17, but every innovation revealed is more than encouraging. Buckle up; it's time to head to Los Santos.